5793 labyrinths found. Showing 2401-2420. Sorted by country, state, city, then zip/postal code. State Rd. 64 East approx 17 miles from Interstate 75 turn Right onto Verna Bethany Rd heading south. Approximately 1/2 mile turn Left onto Gill road (dirt road) follow Gill road to T (272nd. ST East) follow road as it bears to the left to dead end. Sign on gate "Center for New Beginnings". This is a labyrinth in a private fenced yard. Telephone for address and further information. 26.1 N° Lat. ; 81.8W° Long. A walk for a simple mind of thought. Ext 182 on I=-75, Of Sumter Rd. It is called the Lunita. 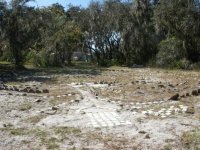 The Labyrinth is located on the nor th side of state road 200 about 4.8 miles west of I-75. It's on the grounds of the First Congregational UCC. Although on those grounds, it is open to all peoples of all faiths and beliefs. It was patterned after the labyrinth in Chartres Cathederal in France and from entrance to exit is .49 miles of pathway. I-75 to Route 200 Exit West for 5.5 miles to SW 80th Ave. turn right, go north for approx. 1 mile, park is on your left. Labyrinth is on south end of Sholom Park. See website for hours and details. Open every day 8 a.m. - 5 p.m. EST; 8 a.m. - 6 p.m. DST. Unique design to reflect the beauiful natural landscape and horticulture of the park with stream, bridges, rose garden, flower gardens, introflective poetry stationed periodically. 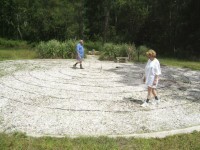 Spirit of Life Unitarian Universalist members Rick Boling and Melodie Oleson walk Labyrinth adjoining Memorial Garden. Labyrinth is open daily to the public. North on Burrell Rd. off Keystone/Tarpon Springs Rd. just east of Boy Scout Rd. Seven-circuit. Labyrinth is wheel chair accessible, but surface is not smooth. We are an open, spiritual community located on a beautiful campus just south of downtown Orlando. 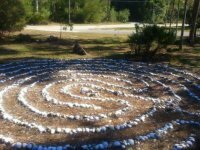 On the north side of Hammock Lane, that runs E-W between Orchard Street and Old Kings Rd., the Harmony labyrinth is in Ormond Central Park. An eleven circuit labyrinth on a concrete pad in the style of Chartres without the the rosette in the center or the ornamentation. 29 16'49.19" N° Lat. ; 81 3' 59.54"W° Long. 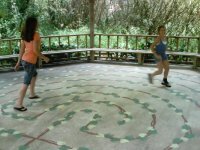 Children enjoy the Peace Labyrinth. 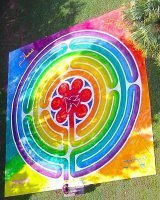 This beautiful "Peace Labyrinth" was created by artist Joan Baliker and painted on the floor of the garden's gazebo by Joan and fellow artist, Carol Bertrand. Visitors are invited to walk the labyrinth and record their experiences in a book kept in the museum. open daily, during daylight hours. Location, The Duncan Center, Delray Beach, FL, November 15, 2014.
from I-95 and Palm Bay Road, go east on Palm Bay Road to Riviera Drive, then turn right, less than a quarter of a mile, Riviera UCC is on the east side of Riviera Drive NE. Saturday May 02, 2015, from 12:00 PM noon until 2:30 PM - World Labyrinth Day 2015. This is a scheduled public event, one day only for World Labyrinth Day 2015.